Identify and recognize the characteristics of standard and high efficiency water conserving toilets as defined by national standards and green building ratings. Investigate the design options and functional differences between different types of flush toilets and their suitability for different buildings types. Assess the functional contributions of flush toilets as they contribute to green and sustainable design. Specify appropriate flush toilets in a variety of green and conventional buildings. Architects and other design professionals recognize that water usage is a growing critical concern in buildings of all types. 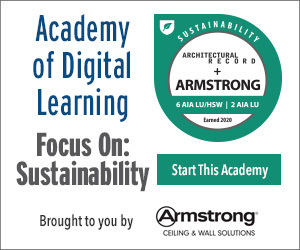 Green building standards address overall water conservation, government regulations and codes dictate performance for specific plumbing fixtures, and end users seek responsible, affordable solutions. Historically, one of the biggest users of water has been the common flush toilet. Since all buildings have multiple restrooms or bathrooms with one or more toilets, making selections based on their water efficiency will directly impact overall water usage. However, like all fixtures in a building, the toilets must also meet all other design requirements for a particular building including long-term, reliable operation and integration with space design. 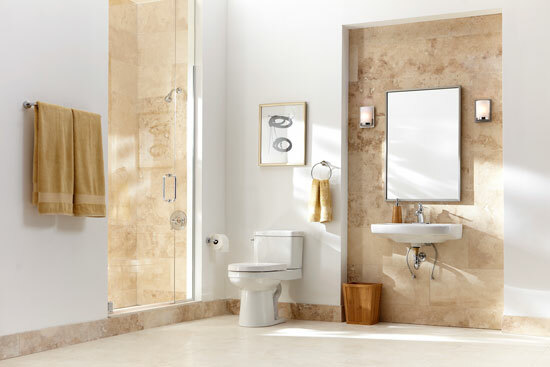 Therefore, since there are many different choices available on the market, it is important to have a fundamental understanding of what to look for when selecting and specifying the most appropriate toilet fixture for a particular project. We can easily take it for granted, but if we think about it, the flush toilet is one of the most enduring and relied upon things that we include in buildings. It uses no electricity to operate, has relatively few moving parts, and uses some rather sophisticated product design to function repeatedly for years without leaks. All we need to do is travel to someplace where they aren’t available and we realize the contribution they make to sanitary and hygienic living when connected to appropriate infrastructure. Bathroom and restroom design combines aesthetic and user needs with the need to comply with regulations and water usage performance.